This name uses Eastern Slavic naming customs; the patronymic is Valeryevichand the family name is Kovalchuk. Ilya Valeryevich Kovalchuk (Russian : Илья Валерьевич Ковальчук; born April 15, 1983) is a Russian professional ice hockey player currently playing for the Los Angeles Kings of the National Hockey League (NHL). He has previously played for the Atlanta Thrashers and New Jersey Devils in the NHL, and Ak Bars Kazan, Khimik Moscow Oblast, and SKA Saint Petersburg in the Russian Superleague (RSL) and Kontinental Hockey League (KHL). Kovalchuk developed in the youth system of Spartak Moscow, joining their senior team in the Vysshaya Liga in 1999. After two seasons with Spartak, he joined the Atlanta Thrashers of the NHL, who selected him first overall in the 2001 NHL Entry Draft. After eight seasons with the Thrashers, he was traded to the New Jersey Devils in 2010, with whom he signed a 15-year, $100 million contract, after a 17-year, $102 million deal was rejected by the NHL. In 2013, he left the NHL to return to Russia, joining SKA Saint Petersburg, where he played for five seasons before returning to the NHL in 2018. HC Spartak Moscow is a professional ice hockey team based in Moscow, Russia. They played in the Tarasov Division of the Kontinental Hockey League during the 2013–14 season. However, the team did not participate in the KHL league for the 2014–15 season because of financial issues, but rejoined the league prior to the 2015–16 season as members of the Bobrov Division. The Vysshaya Liga, also referred as Higher League or Major League and commonly abbreviated as RUS-2, was a second level professional ice hockey league in Russia. The 2001 NHL Entry Draft was held on June 23–24, 2001, at the National Car Rental Center in Sunrise, Florida. Kovalchuk is fifth all-time in the NHL for overtime goals scored (14), 18th all-time in goals per game average (.511), and the seventh-highest scoring Russian in NHL history. In the NHL, Kovalchuk has twice been named to the end of season All-Star Team, and in 2004 finished in a three-way tie for the Maurice "Rocket" Richard Trophy as the NHL's leading goal-scorer, sharing it with Jarome Iginla and Rick Nash. The NHL All-Star Teams were first named at the end of the 1930–31 NHL season, to honor the best performers over the season at each position. The 2003–04 NHL season was the 87th regular season of the National Hockey League. The Stanley Cup champions were the Tampa Bay Lightning, who won the best of seven series four games to three against the Calgary Flames. Internationally, Kovalchuk has played for Russia in the IIHF World U18 Championship, World Junior Championship, World Championship, World Cup and Winter Olympics, and won the 2008 and 2009 World Championships. At the 2018 Winter Olympics, Kovalchuk was named the most valuable player while helping Olympic Athletes from Russia win the gold medal. The Ice Hockey World Championships are an annual international men's ice hockey tournament organized by the International Ice Hockey Federation (IIHF). First officially held at the 1920 Summer Olympics, it is the sport's highest profile annual international tournament. The World Cup of Hockey is an international ice hockey tournament. Inaugurated in 1996, it is the successor to the Canada Cup, which ran from 1976 to 1991 and was the first international hockey championship to allow nations to field their top players. The World Cup has occurred thrice before on an irregular basis, with the United States winning in 1996 and Canada winning in 2004 and 2016. Following the 2016 tournament, it is uncertain if the series will continue, with the 2020 tournament being cancelled. Tver is a city and the administrative centre of Tver Oblast, Russia. Population: 414,606 ; 403,606 ; 408,903 ; 450,941 (1989 Census). 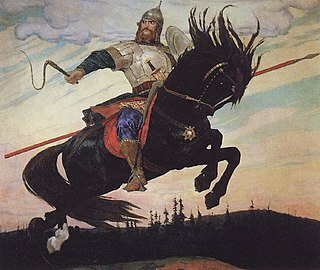 Ilya Muromets, or Ilya of Murom, sometimes Ilya Murometz, is a folk hero of ancient Kievan Rus' - a bogatyr and a character of many bylinas. In the legends he is often featured alongside fellow bogatyrs Dobrynya Nikitich and Alyosha Popovich. Mirage were a 1980s Russian pop group founded in Moscow in 1986 by Russian composer-keyboard player Andrey Litjagin. The original lineup of Mirage included Litjagin, guitarist Sergey Proklov, lyricist Valery Sokolov, vocalist Natalia Gulkina and classically trained vocalist Margarita Suhankina. Their music came at a time when perestroika was radically changing the Soviet Union and their energetic disco sound captured the mood and feeling of their generation. Entering his NHL rookie season in 2001–02, Kovalchuk scored 29 goals and 51 points despite missing 17 games with a season-ending shoulder injury. He finished second in voting to teammate Dany Heatley for the Calder Memorial Trophy as NHL rookie of the year. Both were named to the NHL All-Rookie Team. After improving to 38 goals and 67 points in his second season, Kovalchuk scored 41 goals in 2003–04, making him a co-winner of the Maurice "Rocket" Richard Trophy after tying for the NHL lead in goals with Jarome Iginla of the Calgary Flames and Rick Nash of the Columbus Blue Jackets. He also added 46 assists for 87 points, tying him with Joe Sakic of the Colorado Avalanche for second in the NHL that season, behind Martin St. Louis. Kovalchuk also participated in his first NHL All-Star Game in 2004. Kovalchuk with the Atlanta Thrashers during the 2005–06 season. Due to the 2004–05 NHL lockout, Kovalchuk returned to Russia, playing for both Ak Bars Kazan and Khimik Moscow Oblast of the Russian Superleague (RSL). After the lockout, Kovalchuk and the Thrashers could not initially agree to a new contract, so he stayed in Russia, rejoining Khimik Moscow Oblast. He played 11 games for the team, recording 8 goals and 13 points before returning to the Thrashers and NHL after signing a five-year, $32 million contract. During the 2005–06 season, he scored 52 goals, tying him with rookie Alexander Ovechkin of the Washington Capitals for third in the NHL in scoring, behind Jonathan Cheechoo of the San Jose Sharks (56) and Jaromír Jágr of the New York Rangers (54). He also tied his career-high of 46 assists for a career-high 98 points, leading the Thrashers in team scoring for the second consecutive season, while finishing eighth overall in NHL scoring. He also became the first Thrashers player to score 50 goals in a season. In the 2006–07 season, Kovalchuk's point production dropped for the first time in his career. He finished with 42 goals and 34 assists for 76 points. During a game against the Nashville Predators on January 11, 2006, Predators head coach Barry Trotz accused Kovalchuk with "always plays with an illegal stick". Trotz had asked the referees to check Kovalchuk's stick following a Thrashers goal, but claimed Kovalchuk was able to switch his stick before the referees could check. Despite his drop in production on the season, Kovalchuk and the Thrashers qualified for the Stanley Cup playoffs for the first time in franchise history. Kovalchuk scored one goal and one assist in his NHL playoffs debut as the team lost in the opening round to the New York Rangers in four games. In 2007–08, Kovalchuk scored two consecutive hat-tricks in a loss to the Ottawa Senators and a win against the Tampa Bay Lightning on November 1 and 3, 2007, respectively. Later that season, on January 23, 2008, Kovalchuk was suspended for one game by the NHL for a hit from behind on New York Rangers defenceman Michal Rozsíval in a game a day prior. He finished with his second 52-goal season in three years, along with 35 assists for 87 points. With the departure of Bobby Holík to the New Jersey Devils in the 2008 off-season, the Thrashers' captaincy remained vacant for the first half of the 2008–09 season. Kovalchuk served as one of five alternate captains to start the season until the alternates collectively requested to general manager Don Waddell and head coach John Anderson for Kovalchuk to take over the captaincy. Soon thereafter, on January 11, 2009, Kovalchuk was named Holík's successor and the sixth team captain in Thrashers' history during the team's Casino Night charity event. The announcement came amidst speculation that the Thrashers were looking to trade Kovalchuk, as his contract was set to expire at the end of the following season. Kovalchuk completed his first season as team captain with 43 goals for his fifth consecutive 40-goal season and 91 points. Kovalchuk (top) playing for the New Jersey Devils, alongside Travis Zajac (#19, foreground), Nick Palmieri (#32), and Mark Fayne (#34). Kovalchuk with the Devils during the 2012 Stanley Cup Final. On March 8, Kovalchuk's 13th career hat trick and second hat-trick as a New Jersey Devil was recorded. The Devils won 5–1 against the New York Islanders, with Kovalchuk being the first star of the night. On March 20, Kovalchuk became the 87th player in NHL history to score 400 goals. It was the lone goal of a 1–0 victory over the Ottawa Senators. He was given third star of the night. Kovalchuk ended the 2011–12 season with seven game-deciding shootout goals and 11 shootout goals in total, setting a new record in both categories. The NHL first introduced shootouts in 2005. Kovalchuk and the Devils won the 2011–12 Eastern Conference finals against the New York Rangers in six games, setting a Stanley Cup meeting with the Los Angeles Kings. Despite leading the 2012 playoffs in scoring through the first three rounds, Kovalchuk was playing with a herniated disc and was largely ineffective against the Kings, scoring just one point in the series, an empty-net goal in Game 4, as the Devils fell to the Kings in six games. Kovalchuk with SKA Saint Petersburg in 2012. The first time Kovalchuk faced his former team, the New Jersey Devils was on December 6, 2018. The Devils won 6-3. Two months later, on February 5, 2019, the Kings faced the Devils at Prudential Center. Each time Kovalchuk touched the puck or if PA announcer Kevin Clark mentioned his name, he was severely booed by Devils fans. On that night, the Kings defeated the Devils 5-1, with Kovalchuk picking up one goal in the game. Kovalchuk won his first medals with Russia in a major international event at the IIHF World U18 Championships, earning silver and gold medals in 2000 and 2001, respectively. He also competed for Russia at the World Junior Championships in 2001, but finished seventh. The following year, Kovalchuk made his senior international debut with Russia at the 2002 Winter Olympics in Salt Lake City, during his rookie NHL season with the Atlanta Thrashers. He recorded three points in six games to help Russia to a bronze medal finish. He then made his World Championships debut in 2003, but failed to medal. Kovalchuk made his second straight Winter Olympics appearance in 2006 in Turin. He had a four-goal game on February 19 in a 9–2 win over Latvia, but returned to Atlanta without a medal, losing in the bronze medal game. In 2008, Kovalchuk played in the IIHF World Championship, held in Quebec City. He scored his only two goals of the tournament in the gold medal game against Team Canada – once to force the game into overtime, then the game-winner to give Russia the championship. The following year, he led Russia to a second straight gold medal over Canada in the 2009 IIHF World Championship and was named the tournament MVP. In May 2010, Kovalchuk played for Russia at IIHF World Championship in Germany, finishing second. Kovalchuk with his 2018 Winter Olympic gold medal meeting Russian president Vladimir Putin. Daniel James "Dany" Heatley is a German-born Canadian former professional ice hockey winger. Originally drafted by the Atlanta Thrashers second overall in the 2000 NHL Entry Draft, he won the Calder Memorial Trophy as the top NHL rookie in 2002. However, after being responsible for a car crash in September 2003 that killed teammate and close friend Dan Snyder, he requested a trade and was subsequently dealt to the Ottawa Senators. Pavel Valerievich Datsyuk, also known as The Magic Man, is a Russian professional ice hockey player and captain for SKA Saint Petersburg of the Kontinental Hockey League (KHL). From 2001 to 2016, he played for the Detroit Red Wings of the National Hockey League (NHL). In 2017, Datsyuk was named one of the "100 Greatest NHL Players" in history, and was the only active player outside of the NHL at the time of announcement. Eric Boulton is a Canadian former professional ice hockey left winger. Boulton was drafted 234th overall in the ninth round of the 1994 draft by the New York Rangers. While he never played for the Rangers, he played for the Buffalo Sabres, Atlanta Thrashers, New Jersey Devils and New York Islanders. Niko Klaus Petteri Kapanen is a Finnish former professional ice hockey centre,who last played for HPK of the Finnish Liiga. Todd White is a Canadian former professional ice hockey player. Vyacheslav Anatolevich "Slava" Kozlov is a Russian former professional ice hockey left winger. Kozlov won the Stanley Cup in 1997 and 1998 with the Detroit Red Wings. He also played for the Buffalo Sabres and Atlanta Thrashers. Niclas Bergfors is a Swedish professional ice hockey right winger currently playing for Djurgårdens IF Hockey of the Swedish Hockey League (SHL). He was drafted by the National Hockey League (NHL)'s New Jersey Devils in the first round, 23rd overall, at the 2005 NHL Entry Draft, playing for the organization for four-and-a-half seasons before joining the Atlanta Thrashers 2010, Florida Panthers in 2011 and Nashville Predators via free agency in 2011. He later joined the KHL's Ak Bars Kazan in late 2011 before signing with Severstal Cherepovets. In 2013, he joined Admiral Vladivostok, where he played for three seasons before joining Amur Khabarovsk in a mid-season trade. Oleksiy Volodymyrovych "Alexei" Ponikarovsky is a Ukrainian-Canadian professional ice hockey left winger who is currently an unrestricted free agent. He most recently played for Kunlun Red Star of the Kontinental Hockey League (KHL). Ponikarovsky has previously played in the National Hockey League (NHL) for the Toronto Maple Leafs, Pittsburgh Penguins, Los Angeles Kings, Carolina Hurricanes, Winnipeg Jets and New Jersey Devils, having originally been drafted in the third round, 87th overall, by the Maple Leafs at the 1998 NHL Entry Draft. Vitaly Viktorovich Vishnevskiy is a Russian former professional ice hockey defenceman. He previously played in the National Hockey League for the Mighty Ducks of Anaheim, Atlanta Thrashers, Nashville Predators, and New Jersey Devils, as well as for Lokomotiv Yaroslavl, SKA St. Petersburg and Severstal Cherepovets in the KHL. Alexander Valerievich Radulov is a Russian professional ice hockey player and alternate captain for the Dallas Stars of the National Hockey League (NHL). He had previously had two separate stints with the Nashville Predators, the NHL team which had drafted him, as well one season with the Montreal Canadiens and eight seasons in the Kontinental Hockey League (KHL), split evenly between Salavat Yulaev Ufa and CSKA Moscow. Alexei Alekseyevich Morozov is a retired Russian professional ice hockey player. The 2006–07 Atlanta Thrashers season began with the highest expectations in franchise history, even with the off-season loss of their second-leading scorer, Marc Savard, to the Boston Bruins. Veteran centers Steve Rucchin, Niko Kapanen and Jon Sim were acquired in hopes help fill the loss of Savard. With NHL superstars Marian Hossa and Ilya Kovalchuk and a healthy goaltender, Kari Lehtonen, the Thrashers clinched the first playoff berth in franchise history following the Toronto Maple Leafs' 7–2 loss to the New York Rangers on April 1. The Thrashers had a highly disappointing playoff series against the New York Rangers, as they were swept with losses of 4–3, 2–1, 7–0, and 4–2. Viktor Vasilievich Tikhonov is a Latvian-born Russian professional ice hockey forward currently playing for SKA St. Petersburg of the Kontinental Hockey League (KHL). Tikhonov was originally selected 28th overall in the 2008 NHL Entry Draft, by the Phoenix Coyotes. After several years in the NHL with the Coyotes, Tikhonov moved to the Kontinental Hockey League (KHL) in Russia, where he spent four years with SKA St. Petersburg. In 2015, he returned to the NHL, signing a contract with the Chicago Blackhawks, appearing in 11 games for them before he was claimed on waivers by the Coyotes. Anssi Salmela is a Finnish professional ice hockey defenceman who is currently playing with EHC Biel of the National League (NL). Yevgeny Anatolyevich Dadonov is a Russian professional ice hockey player for the Florida Panthers of the National Hockey League (NHL). He previously played with SKA Saint Petersburg of the Kontinental Hockey League (KHL) having originally played for Traktor Chelyabinsk of the Russian Super League and its successor league, the KHL. Dadonov was selected by the Florida Panthers in the 2007 NHL Entry Draft. Patrice Victor Cormier is a Canadian professional ice hockey forward. He is currently under contract with Barys Astana of the Kontinental Hockey League (KHL). Cormier was drafted in the second round, 54th overall, by the New Jersey Devils at the 2008 NHL Entry Draft. Vladimir Andreyevich Tarasenko is a Russian professional ice hockey right winger currently serving as an alternate captain for the St. Louis Blues of the National Hockey League (NHL). He was originally selected in the first round, 16th overall, in the 2010 NHL Entry Draft by St. Louis, joining the team for the 2012–13 season. 1 2 3 4 Avdeyeva, Svetlana. ""Транмвай желания" Ильи Ковальчука ("Tramway of Desires" by Ilya Kovalchuk)" (in Russian). Karavan.Tver.ru. Retrieved 2017-11-15. ↑ Danilov, Yuri (2010-10-17). "Мультимиллионер, отдавший долг России (Multimillionaire, in Russia's debt)" (in Russian). Hockey.Sport.ua. Retrieved 2017-11-15. ↑ Sovetsky Sport (2005-03-19). "Валерий Ковальчук: Как мой сын стал звездой (Valeri Kovalchuk: How my son became a star)" (in Russian). Sovsport.ru. Retrieved 2017-11-15. ↑ Sovetsky Sport (2005-07-20). "Умер отец Ильи Ковальчука (Ilya Kovalchuk's father died)" (in Russian). Sovsport.ru. Retrieved 2017-11-15. ↑ "Pee-Wee players who have reached NHL or WHA" (PDF). Quebec International Pee-Wee Hockey Tournament. 2018. Retrieved 2019-02-11. 1 2 3 "NHLPA PLAYER BIO: Ilya Kovalchuk". Archived from the original on 2004-11-12. Retrieved 2006-09-13. ↑ Larry Wigge (2001). "Few doubts surround top pick Kovalchuk – National Hockey League Draft, hockey player Ilya Kovalchuk". The Sporting News. Retrieved 2006-09-23. ↑ Sedov, Alexander (2005-09-10). "Ковальчук стал самым дорогим хоккеистом "Атланты" (Kovalchuk became the most expensive Atlanta player)" (in Russian). Sport.ru. Retrieved 2017-11-15. ↑ "Thrashers 4, Predators 3, SO". USA Today. 2006-04-18. Retrieved 2006-09-23. ↑ "Kovalchuk suspended for hitting Rozsival from behind". NHL. 2008. Retrieved 2008-01-23. 1 2 3 "Call him 'captain' Kovalchuk now". Atlanta Journal-Constitution . 2009-01-12. Retrieved 2009-10-29. ↑ "Atlanta Thrashers at St Louis Blues Game Recap". Nhl.com. 2009-10-08. Retrieved 2012-04-10. ↑ "Thrashers lose Kovalchuk, second straight game". Atlanta Journal-Constitution . 2009-10-24. Retrieved 2009-10-29. ↑ Diamos, Jason (2005-08-24). "Thrashers trade Heatley to Senators for Hossa". New York Times. Retrieved 2008-09-29. ↑ TSN (2010-02-04). "Thrashers ship Kovalchuk to Devils for players, 1st Rounder". The Sports Network. Archived from the original on 2010-02-05. Retrieved 2010-02-04. ↑ "Devils storm back late to down Leafs in Kovalchuk's debut". The Sports Network. 2010-02-05. Archived from the original on 2010-02-08. Retrieved 2010-02-05. ↑ "Lemaire reaches 600 wins in Devils edge Leafs". CNN. ↑ "Kovalchuk gets 17-year deal from Devils". ESPN. 2010-07-19. Retrieved 2010-07-19. ↑ "Reports: Arbitrator rules in NHL's favor". National Hockey League. 2010-08-09. Retrieved 2010-08-09. ↑ "Reports: Kovy deal registered as NHL, NHLPA reach settlement". 2010-09-04. Retrieved 2010-09-04. ↑ "New Jersey Devils' penalty for Kovalchuk contract modified". 2014-03-06. Retrieved 2014-08-04. ↑ "Ilya Kovalchuk had a Gordie Howe hat trick". Prohockeytalk.nbcsports.com. Retrieved 2012-04-10. ↑ Kevin Hoffman/US Presswire. "Ilya Kovalchuk surprised to get pass for first hat trick with Devils". NJ.com. Retrieved 2012-04-10. ↑ "A final statistical look at 2011–12 regular season". NHL.com. 2010-04-02. Retrieved 2012-04-10. ↑ "Kovalchuk going to SKA St. Petersburg". ESPN. Retrieved 2012-12-14. ↑ Kimelman, Adam (July 11, 2013). "Devils' Ilya Kovalchuk announces retirement from NHL". NHL.com. Retrieved September 18, 2018. ↑ Chere, Rich (July 11, 2013). "Ilya Kovalchuk leaves Devils in shock after retiring from NHL". NJ.com. Retrieved September 18, 2018. ↑ Gretz, Adam (2013). Ilya Kovalchuk announces retirement "CBSsports – Eyeon hockey"
↑ Allen, Kevin (2013-07-11). "Ilya Kovalchuk says he's retiring from NHL". USA Today. ↑ "Ilya Kovalchuk is with SKA!". July 15, 2013. Archived from the original on July 26, 2013. ↑ Klein, Jeff Z. (July 15, 2013). "Kovalchuk Signs With SKA St. Petersburg of K.H.L." The New York Times. ↑ "Cap Comparables: Ilya Kovalchuk returns to NHL on big-ticket contract". Sportsnet.ca. June 23, 2018. Retrieved July 2, 2018. ↑ "Ilya Kovalchuk Signs 3-Year, $18.75 Million Contract with LA Kings". NHL.com. July 1, 2018. Retrieved July 2, 2018. ↑ "Kovalchuk named MVP". IIHF . 2009-08-24. Archived from the original on 2009-05-13. Retrieved 2009-05-10. Wikimedia Commons has media related to Ilya Kovalchuk .